When Jacob died at the age of 147, Joseph wept and mourned for months. When someone close to us dies, we need a long period of time to work through our grief. Crying and sharing our feelings with others helps us recover and go on with our life. Allow yourself and others the freedom to grieve over the loss of a loved one and give yourself time enough to complete your grieving process. Now that Jacob (Israel) was dead, the brothers feared revenge from Joseph. Could he really have forgiven them for selling him into slavery? But to their surprise, Joseph not only forgave them but reassured them, offering to care for them and their families. Joseph’s forgiveness was complete. He demonstrated how God graciously accepts us even when we have ignored or rejected him, we should graciously forgive others. 9 Both chariots and charioteers went up with him. It was a very great company. 11 When the Canaanite inhabitants of the land saw the mourning on the threshing floor of Atad, they said, “This is a grievous mourning on the part of the Egyptians.” Therefore the place was named Abel mizraim; it is beyond the Jordan. 12 Thus his sons did for him as he had instructed them. 19 But Joseph said to them, “Do not be afraid! Am I in the place of God? 1 Then Joseph threw himself on his father’s face and wept over him and kissed him. 3 they spent forty days in doing this, for that is the time required for embalming. And the Egyptians wept for him seventy days. 10 When they came to the threshing floor of Atad, which is beyond the Jordan, they held there a very great and sorrowful lamentation; and he observed a time of mourning for his father seven days. 13 They carried him to the land of Canaan and buried him in the cave of the field at Machpelah, the field near Mamre, which Abraham bought as a burial site from Ephron the Hittite. 17 ‘Say to Joseph: I beg you, forgive the crime of your brothers and the wrong they did in harming you.’ Now therefore please forgive the crime of the servants of the God of your father.” Joseph wept when they spoke to him. 21 So have no fear; I myself will provide for you and your little ones.” In this way he reassured them, speaking kindly to them. 22 So Joseph remained in Egypt, he and his father’s household; and Joseph lived one hundred ten years. 23 Joseph saw Ephraim’s children of the third generation; the children of Machir son of Manasseh were also born on Joseph’s knees. 26 And Joseph died, being one hundred ten years old; he was embalmed and placed in a coffin in Egypt. Jacob blessed each one of his sons and then made a prediction about each one’s future. The way the men had lived played an important role in Jacob’s blessings and prophecy. Our past also affects our present and future. By sunrise tomorrow our actions will have become our past. Yet they will have already begun to shape the future. What action can you choose or avoid that will positively shape your future? Can you trust God when injury and persecution is directed at you? Such spiritual battles require teamwork between courageous and faithful people and almighty God. 1 Then Jacob called his sons, and said: “Gather around, that I may tell you what will happen to you in days to come. 3 Reuben, you are my firstborn, my might and the first fruits of my vigor, excelling in rank and excelling in power. 4 Unstable as water, you shall no longer excel because you went up onto your father’s bed; then you defiled it — you went up onto my couch! 5 Simeon and Levi are brothers; weapons of violence are their swords. 6 May I never come into their council; may I not be joined to their company — for in their anger they killed men, and at their whim they hamstrung oxen. 7 Cursed be their anger, for it is fierce, and their wrath, for it is cruel! I will divide them in Jacob, and scatter them in Israel. 8 Judah, your brothers shall praise you; your hand shall be on the neck of your enemies; your father’s sons shall bow down before you. 9 Judah is a lion’s whelp; from the prey, my son, you have gone up. He crouches down, he stretches out like a lion, like a lioness — who dares rouse him up? 10 The scepter shall not depart from Judah, nor the ruler’s staff from between his feet, until tribute comes to him; and the obedience of the peoples is his. 13 Zebulun shall settle at the shore of the sea; he shall be a haven for ships, and his border shall be at Sidon. 15 he saw that a resting place was good, and that the land was pleasant; so he bowed his shoulder to the burden, and became a slave at forced labor. 16 Dan shall judge his people as one of the tribes of Israel. 17 Dan shall be a snake by the roadside, a viper along the path, that bites the horse’s heels so that its rider falls backward. 19 Gad shall be raided by raiders, but he shall raid at their heels. 20 Asher’s food shall be rich, and he shall provide royal delicacies. 21 Naphtali is a doe let loose that bears lovely fawns. 22 Joseph is a fruitful bough, a fruitful bough by a spring; his branches run over the wall. 23 The archers fiercely attacked him; they shot at him and pressed him hard. 25 by the God of your father, who will help you, by the Almighty who will bless you with blessings of heaven above, blessings of the deep that lies beneath, blessings of the breasts and of the womb. 26 The blessings of your father are stronger than the blessings of the eternal mountains, the bounties of the everlasting hills; may they be on the head of Joseph, on the brow of him who was set apart from his brothers. 30 in the cave in the field at Machpelah, near Mamre, in the land of Canaan, in the field that Abraham bought from Ephron the Hittite as a burial site. 33 When Jacob ended his charge to his sons, he drew up his feet into the bed, breathed his last, and was gathered to his people. Jacob gave Ephraim, instead of his older brother Manasseh, the greater blessing. When Joseph objected, Jacob refused to listen because God had told him that Ephraim would become greater. God often works in unexpected ways. When he chooses people to fulfill his plans, he always goes deeper than appearance, traditions or position. We need never despair because we belong to a loving God. We never know what good he will bring out of a seemingly hopeless situation. Jacob spoke of God as his shepherd throughout his life. In his old age, he could clearly see his dependence upon God. This marks a total attitude change from his scheming and dishonest youth. To develop an attitude like Jacob’s let God shepherd you as you trust in his provision and care. 20 So he blessed them that day, saying, “By you Israel will invoke blessings, saying, ‘God make you like Ephraim and like Manasseh. '” So he put Ephraim ahead of Manasseh. 21 Then Israel said to Joseph, “I am about to die, but God will be with you and will bring you again to the land of your ancestors. 1 After this Joseph was told, “Your father is ill.” So he took with him his two sons, Manasseh and Ephraim. 2 When Jacob was told, “Your son Joseph has come to you,” he summoned his strength and sat up in bed. 5 Therefore your two sons, who were born to you in the land of Egypt before I came to you in Egypt, are now mine; Ephraim and Manasseh shall be mine, just as Reuben and Simeon are. 6 As for the offspring born to you after them, they shall be yours. They shall be recorded under the names of their brothers with regard to their inheritance. 7 For when I came from Paddan, Rachel, alas, died in the land of Canaan on the way, while there was still some distance to go to Ephrath; and I buried her there on the way to Ephrath” (that is, Bethlehem). 10 Now the eyes of Israel were dim with age, and he could not see well. So Joseph brought them near him; and he kissed them and embraced them. 12 Then Joseph removed them from his father’s knees, and he bowed himself with his face to the earth. 13 Joseph took them both, Ephraim in his right hand toward Israel’s left, and Manasseh in his left hand toward Israel’s right, and brought them near him. 14 But Israel stretched out his right hand and laid it on the head of Ephraim, who was the younger, and his left hand on the head of Manasseh, crossing his hands, for Manasseh was the firstborn. 17 When Joseph saw that his father laid his right hand on the head of Ephraim, it displeased him; so he took his father’s hand, to remove it from Ephraim’s head to Manasseh’s head. The faithfulness of Joseph affected his entire family. When he was in the pit and prison Joseph must have wondered about his future. Instead of despairing, he faithfully obeyed God and did what was right. Here we see one of the exciting results. We may not always see the effects of our faith but we can be sure that God will honor faithfulness. Putting a hand under the thigh was a sign of making a promise just like our hand shaking today. 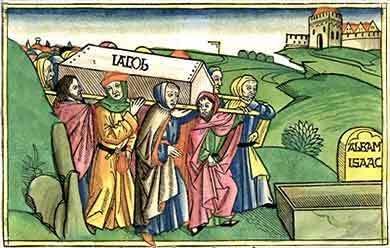 Jacob has Joseph promise to bury him in his homeland. Few things were written in this culture, so person’s words then carried as much force as a written contract today. People today seem to find it easy to say, “I didn’t mean that.” God’s people however, are to speak the truth and live the truth. Let your words be as binding as a written contract. 29 When the time of Israel’s death drew near, he called his son Joseph and said to him, “If I have found favor with you, put your hand under my thigh and promise to deal loyally and truly with me. Do not bury me in Egypt. 31 And he said, “Swear to me”; and he swore to him. Then Israel bowed himself on the head of his bed. 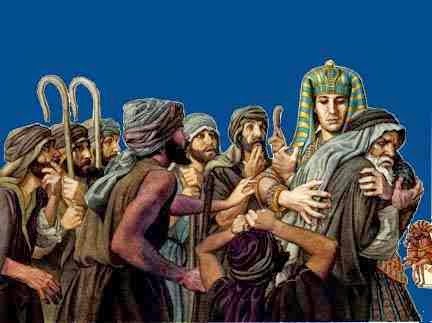 2 From among his brothers he took five men and presented them to Pharaoh. 5 Then Pharaoh said to Joseph, “Your father and your brothers have come to you. 7 Then Joseph brought in his father Jacob, and presented him before Pharaoh, and Jacob blessed Pharaoh. 10 Then Jacob blessed Pharaoh, and went out from the presence of Pharaoh. 11 Joseph settled his father and his brothers, and granted them a holding in the land of Egypt, in the best part of the land, in the land of Rameses, as Pharaoh had instructed. 12 And Joseph provided his father, his brothers, and all his father’s household with food, according to the number of their dependents. 13 Now there was no food in all the land, for the famine was very severe. The land of Egypt and the land of Canaan languished because of the famine. 14 Joseph collected all the money to be found in the land of Egypt and in the land of Canaan, in exchange for the grain that they bought; and Joseph brought the money into Pharaoh’s house. 17 So they brought their livestock to Joseph; and Joseph gave them food in exchange for the horses, the flocks, the herds, and the donkeys. That year he supplied them with food in exchange for all their livestock. 18 When that year was ended, they came to him the following year, and said to him, “We cannot hide from my lord that our money is all spent; and the herds of cattle are my lord’s. There is nothing left in the sight of my lord but our bodies and our lands. 20 So Joseph bought all the land of Egypt for Pharaoh. All the Egyptians sold their fields, because the famine was severe upon them; and the land became Pharaoh’s. 21 As for the people, he made slaves of them from one end of Egypt to the other. 22 Only the land of the priests he did not buy; for the priests had a fixed allowance from Pharaoh, and lived on the allowance that Pharaoh gave them; therefore they did not sell their land. 23 Then Joseph said to the people, “Now that I have this day bought you and your land for Pharaoh, here is seed for you; sow the land. 26 So Joseph made it a statute concerning the land of Egypt, and it stands to this day, that Pharaoh should have the fifth. The land of the priests alone did not become Pharaoh’s. 27 Thus Israel settled in the land of Egypt, in the region of Goshen; and they gained possessions in it, and were fruitful and multiplied exceedingly. 28 Jacob lived in the land of Egypt seventeen years; so the days of Jacob, the years of his life, were one hundred forty-seven years. Jacob moved his whole family to Egypt, but they wanted to live apart from Egyptians. To ensure this Joseph told them to let Pharaoh know they were shepherds. Although Pharaoh may have been sympathetic to shepherds, Egyptian culture would not willingly accept shepherds among them. 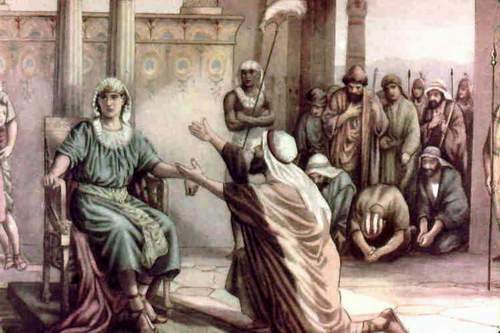 The strategy worked and Jacob’s family was able to benefit from Pharaoh’s generosity as well as Egyptian’s prejudice. 3 Then he said, “I am God, the God of your father; do not be afraid to go down to Egypt, for I will make of you a great nation there. 1 When Israel set out on his journey with all that he had and came to Beer-sheba, he offered sacrifices to the God of his father Isaac. 5 Then Jacob set out from Beer-sheba; and the sons of Israel carried their father Jacob, their little ones, and their wives, in the wagons that Pharaoh had sent to carry him. 7 his sons, and his sons’ sons with him, his daughters, and his sons’ daughters; all his offspring he brought with him into Egypt. 9 and the children of Reuben: Hanoch, Pallu, Hezron, and Carmi. 10 The children of Simeon: Jemuel, Jamin, Ohad, Jachin, Zohar, and Shaul, the son of a Canaanite woman. 11 The children of Levi: Gershon, Kohath, and Merari. 12 The children of Judah: Er, Onan, Shelah, Perez, and Zerah (but Er and Onan died in the land of Canaan); and the children of Perez were Hezron and Hamul. 13 The children of Issachar: Tola, Puvah, Jashub, and Shimron. 15 (these are the sons of Leah, whom she bore to Jacob in Paddan-aram, together with his daughter Dinah; in all his sons and his daughters numbered thirty-three). 16 The children of Gad: Ziphion, Haggi, Shuni, Ezbon, Eri, Arodi, and Areli. 18 (these are the children of Zilpah, whom Laban gave to his daughter Leah; and these she bore to Jacob — sixteen persons). 19 The children of Jacob’s wife Rachel: Joseph and Benjamin. 20 To Joseph in the land of Egypt were born Manasseh and Ephraim, whom Asenath daughter of Potiphera, priest of On, bore to him. 21 The children of Benjamin: Bela, Becher, Ashbel, Gera, Naaman, Ehi, Rosh, Muppim, Huppim, and Ard 22 (these are the children of Rachel, who were born to Jacob — fourteen persons in all). 23 The children of Dan: Hashum. 25 (these are the children of Bilhah, whom Laban gave to his daughter Rachel, and these she bore to Jacob — seven persons in all). 26 All the persons belonging to Jacob who came into Egypt, who were his own offspring, not including the wives of his sons, were sixty-six persons in all. 29 Joseph made ready his chariot and went up to meet his father Israel in Goshen. 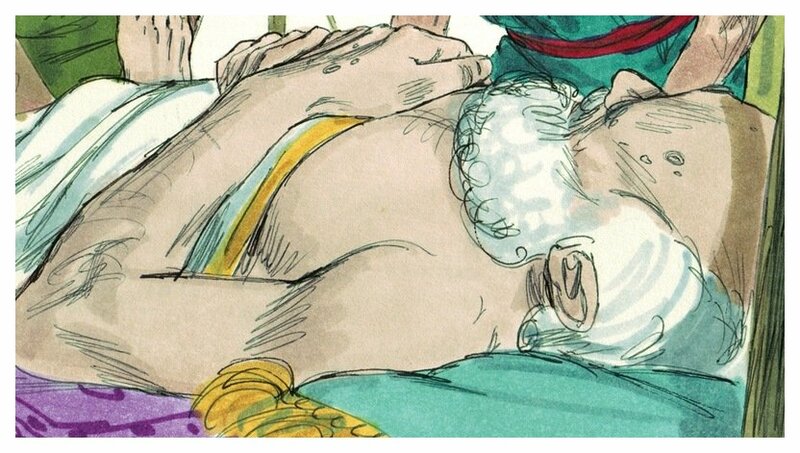 He presented himself to him, fell on his neck, and wept on his neck a good while. 31 Joseph said to his brothers and to his father’s household, “I will go up and tell Pharaoh, and will say to him, ‘My brothers and my father’s household, who were in the land of Canaan, have come to me. Although Joseph’s brothers had wanted to get rid of him, God used even their evil actions to fulfill his ultimate plan. He sent Joseph ahead to pressure their lives, save Egypt, and prepare the way for beginning of the nation of Israel. God is sovereign. His plans are not dictated by human actions. When others intend evil toward you, remember that they are only God’s tools. As Joseph said to his brothers, “You intended to harm me, but God intended it for good to accomplish what is now being done, the saving of many lives” (50:20). Joseph was rejected, kidnapped, enslaved and imprisoned. Although his brothers had been unfaithful to him, he graciously forgave them and shared his prosperity. Joseph demonstrated how God forgives us and showers us with goodness even though we have sinned against him. The same forgiveness and blessings are ours if we ask for them. 8 So it was not you who sent me here, but God; he has made me a father to Pharaoh, and lord of all his house and ruler over all the land of Egypt. 1 Then Joseph could no longer control himself before all those who stood by him, and he cried out, “Send everyone away from me.” So no one stayed with him when Joseph made himself known to his brothers. 2 And he wept so loudly that the Egyptians heard it, and the household of Pharaoh heard it. 4 Then Joseph said to his brothers, “Come closer to me.” And they came closer. He said, “I am your brother, Joseph, whom you sold into Egypt. 6 For the famine has been in the land these two years; and there are five more years in which there will be neither plowing nor harvest. 7 God sent me before you to preserve for you a remnant on earth, and to keep alive for you many survivors. 9 Hurry and go up to my father and say to him, ‘Thus says your son Joseph, God has made me lord of all Egypt; come down to me, do not delay. 10 You shall settle in the land of Goshen, and you shall be near me, you and your children and your children’s children, as well as your flocks, your herds, and all that you have. 12 And now your eyes and the eyes of my brother Benjamin see that it is my own mouth that speaks to you. 14 Then he fell upon his brother Benjamin’s neck and wept, while Benjamin wept upon his neck. 16 When the report was heard in Pharaoh’s house, “Joseph’s brothers have come,” Pharaoh and his servants were pleased. 17 Pharaoh said to Joseph, “Say to your brothers, ‘Do this: load your animals and go back to the land of Canaan. 19 You are further charged to say, ‘Do this: take wagons from the land of Egypt for your little ones and for your wives, and bring your father, and come. 21 The sons of Israel did so. 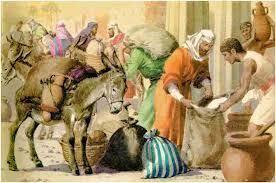 Joseph gave them wagons according to the instruction of Pharaoh, and he gave them provisions for the journey. 22 To each one of them he gave a set of garments; but to Benjamin he gave three hundred pieces of silver and five sets of garments. 23 To his father he sent the following: ten donkeys loaded with the good things of Egypt, and ten female donkeys loaded with grain, bread, and provision for his father on the journey. 26 And they told him, “Joseph is still alive! He is even ruler over all the land of Egypt.” He was stunned; he could not believe them. 27 But when they told him all the words of Joseph that he had said to them, and when he saw the wagons that Joseph had sent to carry him, the spirit of their father Jacob revived. Joseph could have revealed his identity to his brothers at once. But Joseph’s last memory of them was of staring in horror at their faces as slave traders carried him away. Were his brothers still evil and treacherous or had they changed over the years? Joseph decided to put them through a few tests to find out. Joseph remembered his dreams about his brothers bowing down to him (37:6-9). Those dreams were coming true! As a young boy, Joseph was boastful about his dreams. As a man, he no longer flaunted his superior status. He did not feel the need to say “I told you so.” It was not yet time to reveal his identity, so he kept quiet, even when we would like to have the last word. 25 Joseph then gave orders to fill their bags with grain, to return every man’s money to his sack, and to give them provisions for their journey. This was done for them. 1 When Jacob learned that there was grain in Egypt, he said to his sons, “Why do you keep looking at one another? 3 So ten of Joseph’s brothers went down to buy grain in Egypt. 4 But Jacob did not send Joseph’s brother Benjamin with his brothers, for he feared that harm might come to him. 5 Thus the sons of Israel were among the other people who came to buy grain, for the famine had reached the land of Canaan. 8 Although Joseph had recognized his brothers, they did not recognize him. 10 They said to him, “No, my lord; your servants have come to buy food. 14 But Joseph said to them, “It is just as I have said to you; you are spies! 15 Here is how you shall be tested: as Pharaoh lives, you shall not leave this place unless your youngest brother comes here! 20 and bring your youngest brother to me. Thus your words will be verified, and you shall not die.” And they agreed to do so. 23 They did not know that Joseph understood them, since he spoke with them through an interpreter. 24 He turned away from them and wept; then he returned and spoke to them. And he picked out Simeon and had him bound before their eyes. 27 When one of them opened his sack to give his donkey fodder at the lodging place, he saw his money at the top of the sack. 30 “The man, the lord of the land, spoke harshly to us, and charged us with spying on the land. 31 But we said to him, ‘We are honest men, we are not spies. 33 Then the man, the lord of the land, said to us, ‘By this I shall know that you are honest men: leave one of your brothers with me, take grain for the famine of your households, and go your way. 34 Bring your youngest brother to me, and I shall know that you are not spies but honest men.